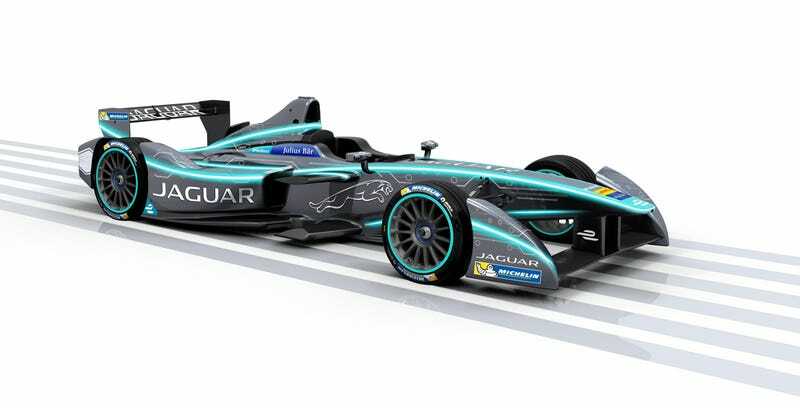 Jaguar Land Rover intends to put fully electric cars on the market in the long run, and there’s no better way to develop their technology than to go back to racing with their old pals at Williams. We can only approve. The company announced today it will make a return to global motorsports in 2016 with the third season of the all-electric FIA Formula E Championship. Williams Advanced Engineering signs on as the team’s technical partner. Jaguar and Williams have been like bread and butter for quite a few years now, and it should come as no surprise that the team at Williams Advanced Engineering always has some secret JLR products hidden behind their doors. Parked next to equally secret Nissans. Williams is also the sole battery supplier of the FIA Formula E series, and their 2016 packs got upgraded to give those futuristic race cars even more speed for the next season. Since the technical support part of the gig will now transfer to Spark Racing Technologies from them, Williams could finally team up with Jaguar to take care of the factory racing team as well as to work on their electric road car projects using the same technologies. This is a win-win for everybody. Jaguar gets a test bed and all the motorsport publicity. Williams gets an exciting new project while the FIA landed a new manufacturer for Formula E. Fans get an exciting team to watch in a growing racing series. And we will get new electric cars. JLR just won’t tell when exactly.